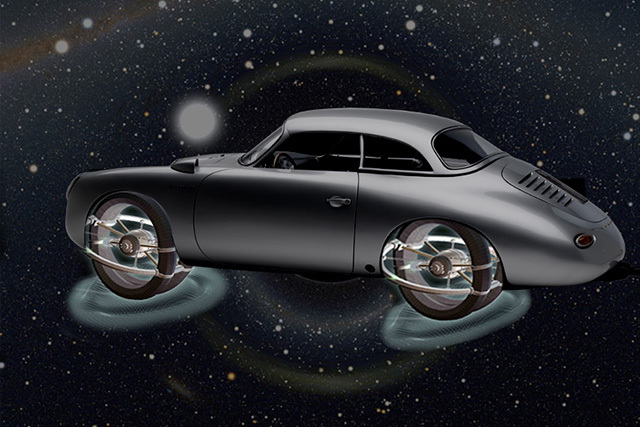 Citing advances in theoretical physics and warp-drive propulsion systems, Sage Cheshire Aerospace announced today a joint venture with its partner Emory Motorsports to develop a hybrid high-speed transportation platform for NASA. Taking lessons learned from Red Bull Stratos about space suit design and life support systems in hostile environments, the team has developed all-new tools, procedures and a vehicle which will keep astronaut-explorers safe as they warp space-time. Art Thompson, president of Sage Cheshire Aerospace said, “This thing is gonna be so cool, in more ways than one.” Using a modified Porsche power plant and the newest warp-drive technology, the vehicle, code-named “Huevos,” will be able to transport a small family to the outer reaches of the galaxy in no time, with some luggage. The announcement comes at the same time that a new exhibit featuring the Red Bull Stratos capsule and space suit opens at the Smithsonian National Air and Space Museum in Washington D.C.